Our sincerest thanks to everyone who attended the second public meeting. We also take this opportunity to applaud the staff and volunteers at The Club for running the event so smoothly on our behalf. We sincerely apologise if you missed an opportunity to be inside during the presentation, and we hope these minutes capture everything for you. Due to health & safety regulations, The Club had to limit entry to 430 people. Mangawhai Central is, and always will be, a community-led project and we were again heartened by the huge level of interest on Friday. To have more than 430 people take time out to attend, express ideas and ask the tough questions, was deeply appreciated by the project team. The evening was a chance to update the community on the project, to confirm settlement of the land, and again reassure everyone that consultation and open transparency is assured. Everyone can play a meaningful role in the creation of this exciting, integrated development, and we encourage your ongoing participation. If you were unable to attend, we urge you to try and get to the next meeting. There will never be a perfect date, or time to suit 100% of the community, but we do try to take on board all constructive feedback around venue ideas and timings. Smaller scale workshops will be delivered in the coming months, based around various activities e.g. light industrial, retail, recreational facilities and so on. Further details on how these will run, will be provided soon. Remember, these meetings are not for Mangawhai Central to ‘sell’ you a fixed concept – they are for presenting ideas and canvassing your feedback. As the appointed real estate agency for Mangawhai Central, the evening was opened by Bayleys in the North Owner/Director, Mark Macky. Mark welcomed and thanked everyone for being at the meeting. He highlighted the increased demand for new amenities and housing in the area and reiterated that Mangawhai is fortunate to have a developer committed to consultation with its community and that this is not a typical scenario. Mark Macky then returned to introduce Viranda’s Co-Founder and Chairman, Andrew Guest. Andrew thanked all attendees for being at the meeting and acknowledged the Kaipara Mayor, Dr Jason Smith, and Deputy Mayor, Peter Wethey, along with Councillors and other dignitaries. Andrew also welcomed voluntary groups within the community including Mangawhai Activity Zone (MAZ), Surf Lifesaving, the Museum and so on. He explained that he has attended many meetings with local community groups and will continue to do so. Apology: due to technical issues, the date of this public meeting is approximately 17 weeks later than hoped. This is a large scale project with estuary, water, ecological and even a survey issue that had to be dealt with. Full settlement of the land marked the right milestone to confidently express our full commitment and a minority shareholding in this project. Corrections/Explanations: before the first public meeting (23rd June 2017), Andrew felt the attitude to the type of buildings erected on the Mangawhai Central land had been accurately canvassed, and that apartments would not be welcome. However the project team admits to wrongly interpreting that statement, and upon further feedback have discovered the appetite for apartments is not ‘off the table’ and is something that should still be explored. – We have crossed the Rubicon and are fully committed to the project! – These public meetings will become regular, possibly August for the next one. – Workshops will also be held with 1-2 members of the project team, to discuss the scope and details of the development across different subjects/interest groups. – All presentations this evening are a broad concept that we are working towards – a discussion to bring to the community that has taken into account traffic, resources and amenities that are required in a community, and how it might work. (1) A debate within the community to decide what is important. (2) Plus, a debate between community and Council. – Essentially this is a project that everyone has a meaningful chance to design for the good of the Mangawhai community. – The project team believes this is a legacy project, something that visitors from around NZ can sense our pride in it, something that takes the community into the next century – for its descendants, and the continued spirit of Mangawhai. A project that provides connectivity between the Village and the Heads. – The Project Team are the least important because they are simply tasked with saying “yes” to as many of your differing interests as possible. – Next in line is the Council, charged with the political, regulatory and statutory responsibilities to develop regions. – At the top of the pecking order is community. This is an unusual opportunity to participate and Mangawhai Central is inviting the community to come together to speak reasonably and intellectually – based on fact (not prejudice), and decide upon the best plan. – The foot has never left the accelerator and there has been huge progress since our meeting last June. While Facebook comments suggest we had stopped, this was never the case. Our communications team reviews every post – negative and positive, and we have learnt to expect all kinds of comments. But common sense has to win for the good of our senior citizens, for connectivity, and for our descendants to enjoy. Everyone is a stakeholder – it’s your project. – The full technical team is here tonight – Planning, Engineering, Consents, Land Development Manager, Projects Manager, my Business Partner. Our office is an open team and we will be here as much, or as briefly, as you require. – The Mangawhai Central website will be updated and fully interactive as information unfolds. – Monthly workshops will be advertised and provided to you as an opportunity to be involved in the design phases, across all interest groups. Andrew outlined Mangawhai Central’s commitment to being good citizens within the community. He stressed that the project team have sought out voluntary groups to help, they have not come forward to ask. 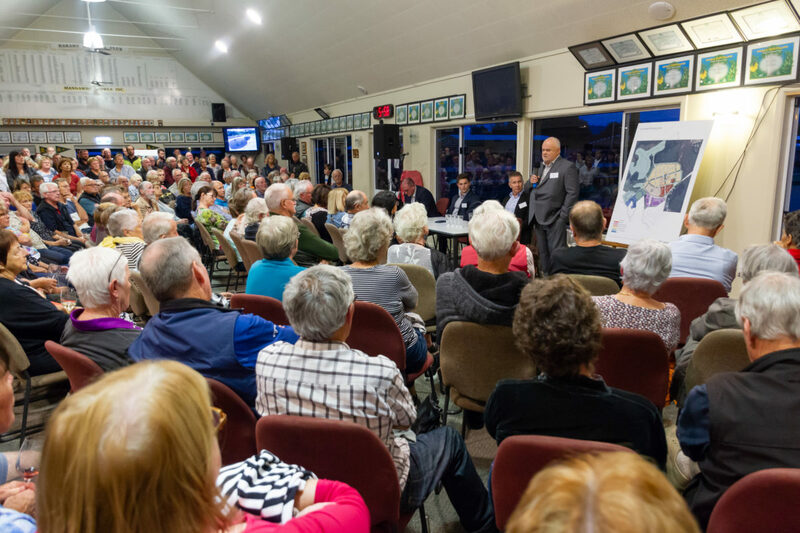 – Mangawhai Surf Club to protect its clubhouse facilities, e.g. paint the interior and exterior of the building, plus provide resources to preserve the beachside perimeter of the site. Also to run the various first-aid courses identified. – Mangawhai Museum, sponsorship of the displays, in a shadow sense Mangawhai Central will fund a further three exhibitions of this incredible facility. – Mangawhai Activity Zone (MAZ), this magnificent project requires a sound shell which will be a fantastic attribute to Mangawhai. Subject to the early discussions around pricing, Mangawhai Central is committed to funding the sound shell. After the formal presentation, an informal session of questions and answers took place and is outlined below. On behalf of the project management team at Mangawhai Central, we appreciate your interest in this wonderful project. What supermarket will we get? It was confirmed that all major operators are interested and negotiations are currently taking place. What is happening with the sewage, how will we be affected in terms of contributions? It will effect residents costs, but it should be that it lowers the required contribution. A development of this size should help to retire a large chunk of the original debt. Has there been any firming up of what might be in the development yet? It is more than conceptual now, but it falls short of a fixed plan. The drawings around the room depict the vision we wish to follow and Andrew spoke to each of the areas on the plans. He confirmed that interest from operators/tenants is genuine. He spoke of it taking place in stages, and that it would be done aesthetically to a high standard. Management and ownership structure, more details please? The ownership of the land is Mangawhai Central Limited, of which Viranda Partners owns 10% (no debt) and the balance is Murphys Development Limited – a well-funded company with a proven track record of large developments. Viranda are the project managers. Roading, particularly parking and traffic flow – we urge you consider it. Our planners and technical designers are specifically addressing this and it has not been underestimated. Plenty of solutions are being considered and rest assured you will be kept informed. The Village and the Heads character should be maintained. Mangawhai Central recognises the importance of this and believes all commercial areas can prosper and should embrace the increased infrastructure, designed to serve everyone better. The Mayor spoke at this point, clarifying that as part of the long-term plan, the projection of growth across the district is closely considered and that a development like this should help absorb the growth, and add to the attractiveness of the community, not divide it. Water infrastructure – what will happen and what impact will it have on the community? This is Mangawhai Central’s responsibility and rest assured it will be solved, likely through our own funded water system. It will not be the community’s burden. Te Whai Community Trust raised the possible burden of food requirements with more people coming. Andrew believed this was a socio-political issue to address, not a burden that a new development alone should be responsible for. How do we keep the kids/grandchildren here, particularly once the building boom is over? A very good point raised, and Mangawhai Central would like the development to consider ways to address this issue, perhaps through employment type activities. We don’t have the specific answers yet. Are there still plans for a medical centre? Yes, a comprehensive, modern facility with hopefully a landing pad and day beds is being explored, with good engagement taking place between Northland DHB and various stakeholders. What happens first? How does this unfold? Commercial or residential? Although early in the planning and things will no doubt evolve, we do not need to build housing to fund the balance of the development. All of it will be good quality and under one architectural banner. The immediate requirement is to solve traffic flow. As a broad outline for stage one; light industrial needs to go ahead, the main street and retail area including a supermarket needs to go ahead, and perhaps some residential. You need representation from the younger people within our community, perhaps via specific activity areas, how will you get that? We agree and have started a consultative approach, with provision to keep this going. The discussions with the school have begun. Bayleys are talking to people interested in light industrial opportunities. Council has been dealing with retail groups, petrol station and a supermarket. As for community group discussion, yes this will certainly take place now that we have settled and we do plan to make this activity specific. When will construction start? What are the timings? There are two powers at play; community consensus will need to lead this, as will Council. Therefore the answer is tempered by the process ahead of us. Have you spoken to the primary school to see if you can combine a primary and high school? Some of our focus has been on the technical issues required for settlement, therefore this area has been sidelined slightly but never taken off the agenda. A productive meeting has now taken place on the high school. A primary school shift from years 1-13 requires us to buy the primary school. They’ve just applied for more classrooms, so we are very keen to have open discussions and will hopefully have more details at the next public meeting. Further clarification (3 May 18): This is a significant topic that requires lengthy engagement with the Ministry of Education (MOE). If the MOE decided the best way forward is to trade a portion of land to facilitate an all-ages school in one location, then we would welcome these discussions. It is important to note, that at this stage Mangawhai Central has not engaged with the new government on this basis.